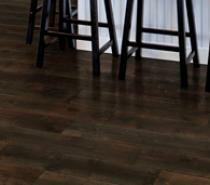 Anderson’s Biltmore™ Baroque collection is the first 8” solid plank made 100% from recycled mill by-products. The carriage house at Biltmore with its massive wooden doors and rough-sawn woodwork, now worn and scraped from years of equestrian coming-and-goings was the inspiration for this collection of hand-scraped solid wood floors. The warm brown tones of the Bitlmore Cider House collection bring back memories of pleasurable and satisfying treats created from fresh picked autumn apples produced on the estate. The richly textured wood bears beautiful chisled evidence of the woodcarving skill that went into the creation of Vanderbilt’s hand-carved book rack designed by his friend and architect, Richard Morris Hunt. This was immediately an inspiration for the family of individually hand-scraped engineered planks that is Conservatory Plank. 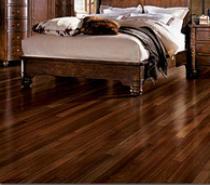 Estate Exotics™ is a unique collection, from domestic sustainable forests, that captures the beauty and appeal of exotics. It features the exclusive PermaColor™ natural aging process for deep, high-gloss color without the use of stains, solvents or chemicals. Of course, not everyone who enjoyed Biltmore’s grand ballrooms and marble staircases was lucky enough to have been Mr. and Mrs. Vanderbilt’s guest. Keeping a 175,000 sq. ft. house running smoothly required the efforts of dozens and dozens of workers–cooks, housemaids, engineers, mechanics, stable hands…right down to scullery maids. And all of them needed a place to live, sleep, eat, and socialize. So the upper and lower floors of Biltmore House are full of kitchens, living quarters, common area and work rooms for Biltmore Estate staff. And the woodwork and furnishings of these simple, well-designed, comfortable spaces made a natural inspiration for a group of authentically distressed engineered planks. The forests that enfold Biltmore Estate today-as well as the weathered outbuildings that housed the animals and equipment that maintained them-inspired a rustic suite of distressed, rustic engineered planks that is Olmsted Forest Plank. Hewn from sturdy South Hickory and hand crafted and hand scraped by artisans, this 3/4″ solid hardwood floor delivers the durability to stand up to the demands of today’s households and the warm beauty that says “Welcome Home” to its owners. With Anderson’s Biltmore™ For your home collection, it’s now easier than ever to bring the qualities and characteristics of the spirit of Biltmore ™ into your home.